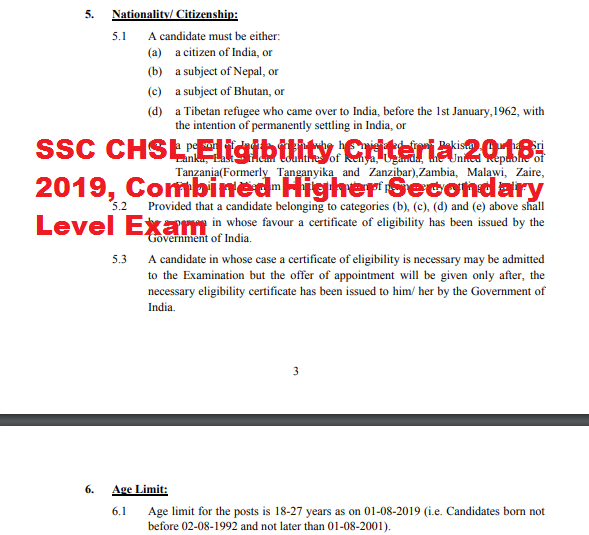 A candidate in whose case a certificate of eligibility is necessary may be admitted to the Examination but the offer of appointment will be given only after, the necessary eligibility certificate has been issued to him/ her by the Government of India. As per Ministry of Human Resource Development Notification dated 10-06-2015 published in Gazette of India all the degrees/ diplomas /certificates awarded through Open and Distance Learning mode of education by the Universities established by an Act of Parliament or State Legislature, Institutions Deemed to be Universities under Section 3 of the University Grant Commission Act 1956 and Institutions of National Importance declared under an Act of Parliament stand automatically recognized for the purpose of employment to posts and services under the Central Government provided they have been approved by the University Grants Commission. Candidates who have not yet acquired but will acquire the educational qualification and produce documentary evidence from the Board/University in support thereof as on 01-08-2019 will also be eligible. All candidates who are declared qualified by the Commission for Document Verification will be required to produce the relevant Certificates such as Mark sheets, Provisional Certificates etc. for completion of Intermediate/ Higher Secondary/ 10+2/ Senior Secondary in original as proof of having acquired the minimum educational qualification on or before 01-08-2019, failing which the candidature of such candidates will be cancelled by the Commission. The candidates who are able to prove, by documentary evidence, that the result of the qualifying examination was declared on or before the cut-off date i.e. 01-08-2019 and he/ she has been declared passed, will also be considered to meet the educational qualification. In case of the candidates possessing equivalent educational qualification, such candidates shall also produce relevant Equivalence Certificate from the concerned authorities at the time of Document Verification. However, final decision regarding selection of such candidates will be taken by the concerned User Departments.